← Long Beach Marathon. It’s Happening. My second marathon is in the books. 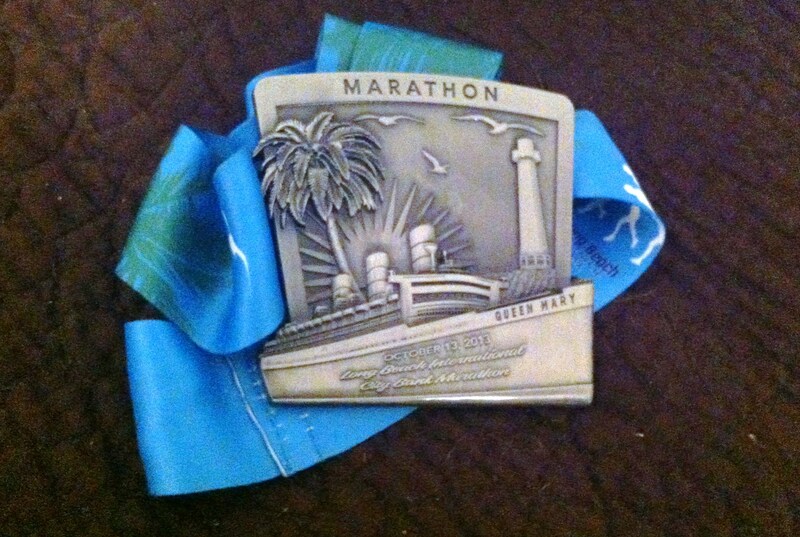 I conquered the Long Beach Marathon yesterday with a 32 min PR. All photos after the above one were taken and edited by Joe who is way more talented with a camera than I will ever be. This is a long post. If you want the short version: I ran hard, finished in 4:50 beating my B goal by 10 mins. I didn’t walk during the final mile, completing one of my non-time specific goals. I may have injured my ankle but I finished with a big smile on my face. I woke up at 4 am on Sunday morning. I stretched, covered my body in body glide (I was hoping to avoid the chafing issues I had in Chicago), got my hydration game going, took some Advil (I know, I know, and it came back to bite me later) and hit the road with Joe. I don’t want to gush too much but he woke up early with me, handled all the driving, parking, and communication with my friends who showed up to spectate, plus he was my personal race photographer, assistant after the race when I was hobbling around and was just 100% proud and supportive while doing it. It was his first marathon experience ever and I think he enjoyed it but not enough to run one himself. He is just a fantastic human being. We made it to Long Beach quickly. I hopped out of the car and walked to the start line. I was able to easily hop into the porta potty line and navigate around the starter area. One of the benefits of the Long Beach Marathon is that there are only 5,000 runners. Far fewer people than run the Chicago Marathon. It was still dark outside. I stretched out a bit more and hopped into the corral. Because there are so few runners the entire corral system is open for the full marathon. Unfortunately there was a delay starting the race because the course was not clear. The race ended up starting 17 mins late. I had to go to the bathroom again but was unable to access the bathroom because the porta potties were lined up on the other side of all the bicyclists who were doing the bike tour. During the delay I chatted with a nice lady who was running her first marathon. She was from Georgia. I was a bit nervous and, like last time, talking to a stranger calmed me down. It only took 2 mins for me to get to the start line. Everyone around me started running before they reached the timing mat. WHY? I was going to walk for as long as I could before I had to run. The start was crowded but I managed to spot Joe just as I was passing him. He didn’t see me at first but managed to get this photo. Where’s Katherine? Side note: the weather was flawless for running. The temps were in the 60’s and there was cloud cover for most of the race. Much more pleasant than it was in Chicago two years ago. The first 6 miles of the course took us out over a small bridge, over to the Queen Mary and around back south on the bike path. I decided quickly to think of the race as 4- 6 mile segments. The first one was very nice. Obviously, it was the beginning of the race and we could see the sun rising over the ocean. Within a mile I knew I had to stop to use the porta potty and figured I should do it sooner than later. Stopping running is always easier first thing in the race. Like my last marathon, I was jealous of the men who could just pull to the side of the road and go. I waited in a short bathroom line and was on my merry way. I was conscious of the cardinal rule of running: Don’t go out too fast. I had picked up a 4:45 pace band from the expo and I wore it with my running watch. This is the first race I’ve done with my running watch. I let my body pick the pace for the first 6 miles. I wanted it to be slow and maintainable obviously. I was running probably about :30 per mile faster than the pace band but the pace felt easy. The major highlight of the first 6 miles was seeing Julie Weiss. 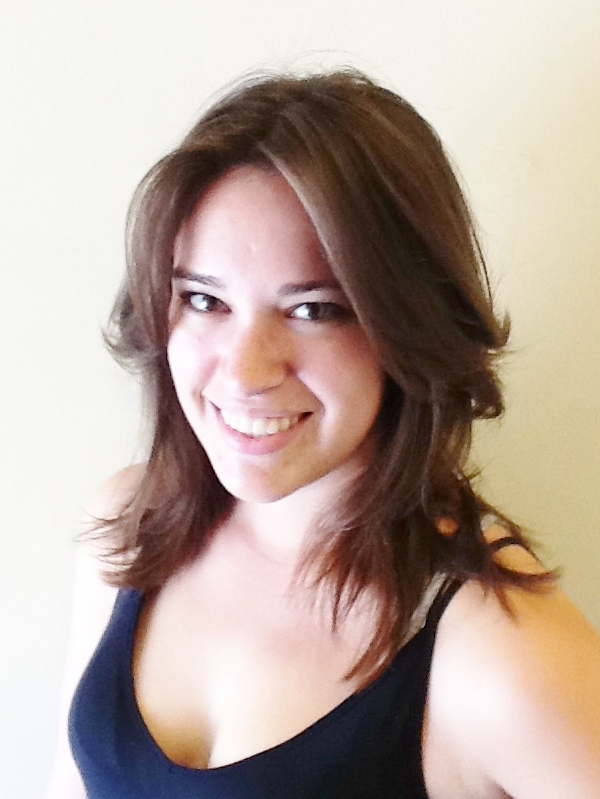 Julie was featured in Spirit of the Marathon 2. She lives in Santa Monica and ran 52 marathons in 1 year to raise money for pancreatic cancer. She is a total badass and pretty inspirational. I yelled her name instinctively upon seeing her. She didn’t hear me but her friend (who is running 12 marathons in 1 year) did and pointed me out. I ran alongside them for about 1 min and we chatted about the 2011 Chicago Marathon which we both ran. It was a pretty cool running celebrity sighting. I felt great during the first quarter of the race and I saw Joe standing at the mile 6 sign. I was so excited to see him. After that I was a little weary because I knew I still had a long way to go and wouldn’t see him again until the final miles. The route went down the bike path. The sun was peeking out through the clouds and it was breathtaking. My only complaint is that the path was narrow and some girl had her unregistered boyfriend riding alongside her on a bike. It annoyed me and pushed me to get in front of them. The second quarter of the race flew by. I was doing my usual routine, taking energy chews ever 45 mins or so and grabbing water from the stations. I ran while I fueled until the halfway point. Around mile 8 I started to get hungry. I didn’t want to blow through my gels too fast so when I saw the Long Beach Tri Club around mile 8 or 9 with glazed donut holes I took full advantage. I was a bit nervous about taking a donut during a race because I’ve never eaten one while running before but I was hungry and decided to ditch conventional wisdom at eat the donut hole. I took it slowly and it felt good in my stomach thank goodness. Best race treat ever! The miles between 9 and 17 flew by. I hit the half point, and headed towards Cal State Long Beach. I ran down “the hill” which would come back at mile 21. That portion of the course was out and back so I saw the elite runners which was cool. I was feeling great, staying positive, and having an easy time holding on to my pace. I started to walk through water stations after mile 13 and taking two cups because I was thirsty. I was careful not to over hydrate. At mile 17 we ran into the CSULB campus. This is where my pace started to wane a bit. The area around the campus was duller than the rest of the course and there were some rolling hills. I did appreciate the frat bros who came out to cheer. Some were even dressed like zombies! Spectators really keep me going during a race. I rely on them to keep me moving. The course was pretty thin with spectators but it made me appreciate those that came out more. I decided to dedicate mile 18 to my best friend who started me running, Carolyn. She is my bicoastal bestie and ran her first half 7 months before I ran my first half. I didn’t think I could run 13.1 miles until she encouraged me. She’s been dealing with injuries over the past couple of years and hasn’t been healthy enough to run NYCM so she’s been deferring her entry fee. Thinking of her helped me push through mile 18. Before I knew it I was at mile 20. I was so relieved to see the mile 20 marker. Only another 10k to go! At this point in the race I felt WAY better than I had in Chicago. I was tired and sore but I knew I was going to at least PR. I started to take walk breaks. I kept them short but I knew that my pace was dropping. At mile 21 I walked up the big hill because I knew I needed to conserve energy. My brain was yelling “run!” but I knew it would only burn what little energy I had left. I was glad to reach the hill because we were running along the out and back again. I could visualize the rest of the course and I knew my spectators would come up eventually. Funny and gross thing: around this point in the course there was a road kill squirrel in the middle of the course. Around my mile 21 walk break I felt a tick in my left ankle. It was mild but not the type of pain you’re supposed to experience during a marathon. I’ve never had any ankle pain while running and my right ankle felt fine. This is how I knew my left ankle was not ok. The whole thing caught me off guard. I knew that the moment I finished I need to get to a medical tent and I hoped it wouldn’t get much worse before then. The pain went away after I started running and I didn’t feel it at all after mile 24. I kept trotting along, taking a run/walk approach to get to the finish line after mile 21. I could tell from looking at my pace band that I was not going to make a sub 4:45 finish but I knew if I kept battling I could get my sub 5 hr finish I wanted so badly. Instinctively, my mind went into battle mode. I dug deep and thought about my friends who couldn’t run marathons, the people who died or were injured at the Boston Marathon last spring, and passing the bar on the second time after failing it the first time around. These were my main motivators through the final miles. I thought about how much I wanted to see Joe and my friends who came out for the race. I thought about my post race meal. Hell, I thought about anything that would keep me going when I wanted to quit. At mile 22 some guy on the sideline said “Katherine, carry me on your shoulders”. It’s hokey but his words helped push me. I started to think running the LA Marathon in March isn’t a crazy. Around this point in the course the half marathoner course met back up with the marathon course. This was not my favorite thing. Almost all of the half marathoners I saw at that point were walking. They were supposed to stay to the left of the course and there were even cones to mark it but they were bleeding pretty heavily into the marathon course and I had to expend a lot of energy in the final miles bobbing and weaving around them. This was probably my only major complaint about the Long Beach Marathon. The half marathoners split from the full marathoners after mile 26 so they didn’t clog the marathon finish line which was nice. At mile 24 I saw Joe, my friend Gwen and my coworker Melody (whose husband ran the half and set a big PR). Melody had an awesome sign that said “Batman never ran a (half) marathon”. I have never been happier to see three people in my life. Around this time I fell into pace with a man who can only be described as my marathon angel (he is the shirtless tattooed man in the above photo). He saw me walking after mile 24. I never truly “hit the wall” but miles 23-26.2 brought me close. I was so ready to be done. The tattooed man said something to the effect of: “run girl, we’re almost there!” I obeyed his ordered and stuck with him to the finish line. At mile 25 I remembered my goal and told him “do not let me walk”. I ran 80% of mile 24. At mile 25 I ran and did not stop until I hit the finish line! Everything in me walked to walk. My legs were screaming. My fingers were swelling. I wanted to walk but every time I said “go on without me!” tattoo man refused to leave me. I asked him to let me walk at least three times. Each time I asked him to go on because I felt like I was holding him back and, let’s face it, I really wanted to walk. At mile 25.2 I saw the big Jet Blue extra mile sign and I could see the message of encouragement Gillian left me! I felt like the mile 26 sign would never come but it finally did. At mile 26.1 we turned the corner and headed downhill to the finish. Tattoo man pulled away and I ran to the finish, crossing the line in 4:50:50. That is an 11:06 min/mile pace, a 32 min PR and more than a min faster per mile than my Chicago Marathon pace. For the record tattoo man did turn around after he hit the finish to give me a high five. I thanked him profusely for getting me through those final, most challenging two miles. I staggered through the finisher chute grabbing my space blanket, water, medal and food goodie bag. I ambled around the crowd near the end of the finisher chute (for the record, people crowding the finish chute… please step back. You’ll find your people and I just ran 26.2 miles so please get out of my way I’m having a hard enough time walking as it is). I went to the medical tent where I got iced and reprimanded (rightfully so) for taking Advil before a race. My body but most noticeably my fingers were very swollen after I finished. It scared me. The medical tent is not somewhere you want to be at the end of a race. Joe was outside the medical tent and it felt so good to be reunited. Gwen came up to us pretty soon after I got out of the medical tent. We headed over to Beachwood for a post race lunch of beer, tater top casserole and a ham and brie sandwich with Oliver and Melody. I spent all day yesterday taking an ice bath, watching football, taking an hour and a half long nap and generally relaxing. I drank 3 vitamin waters per the medical tent doctor’s orders and got almost 10 hours of sleep last night. I knew the even splits I wanted were shot to hell after mile 20. The Long Beach Marathon website breaks them down in this really cool way. Overall, I am very happy with my performance. Passing almost 300 people in the back half? I’ll take it! It would have been really amazing to hit 4:45 but I set a HUGE PR and I haven’t set a PR since June 2010. I’m basking in the post marathon glow, hobbling around and enjoying plenty of treats. My ankle feels OK (for now) and I plan to rest all week and then slowly ease back into running next week. Thanks to everyone for their words of encouragement! I feel blessed that people read this blog and give me encouragement. It really means a lot to me. Thank you! I ❤ race reports, especially when the runner is coming off a running high and a big PR. Once again, congrats on the huge PR. Your training definitely paid off. I bet the crowd support at LB must feel sparse compared to Chicago, but it's still a well-run race and you can't beat the views in the early part of the race or the likelihood of having pretty good weather (hello, marine layer). I had a tough time running LB a few years ago going in injured. It really sucked and hopefully I can avenge that personal worst. My eyes may have not welled up reading this. Seriously — so happy for you and inspired by your mental toughness and effort out there yesterday! Also — so glad you saw my sign!! I saw it when I was at Mile 12 and noticed it was super washed out. Congrats on the huge PR! It looks like your training paid off, and you’re totally rocking the post-bar races!